Simon Max Hill, a fun-loving Portland casting director who enjoys an improvisational approach to auditioning actors, posted a call recently looking for very tall women. 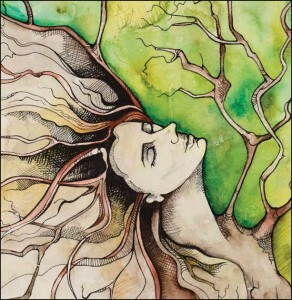 I handed it off to my beautiful friend Kari Gale, an artist* and a model who is six feet three. She submitted herself and got the audition, which involved laughing and crying on cue. Simon put her on camera and she laughed and laughed. Then he asked her to cry. She gave it her best shot and after a moment despondently shrugged, “I got nuthin’”. He understood. And they laughed. 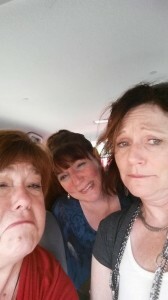 My friends Cindi, Lisa & Joni…practicing my crying technique. Even experienced actors sometimes have a little trouble with roles involving crying. Yet the mechanics are the same as that of laughter: the breath is interrupted, the belly moves, and the face contorts. Recently I found myself demonstrating this to some actor friends of mine who were visiting with me on a trip to the Oregon Coast. They burst into laughter at my artificial approach. But what they didn’t know because I don’t talk much about my auditions and jobs (see My Secret Life) is that I had just booked the role of the mother of the lead in a Portland-based film. My audition had involved terror as well as sobbing. I had “nuthin’” to start with but I made myself heavy and adjusted my breathing. As I said my lines and focused on the story being told, my thoughts became the thoughts of the character. Soon my eyes (and nose) filled with tears. And a few days later I got the call. Me crying on a 911 call for television’s The Last Kind. At least I think my crying is why I got the job. With casting, you never know! *Kari Gale’s painting with accompanying text (not shown) is part of a curated show which was featured in downtown Portland last month as part of the ‘First Thursday’ Artwalk. The show, called “Words of Love”, is one in which artists chose different quotes about love to inspire their work. Currently the show is on display in the Imago dei Church and will be part of the Art of Love Auction for the non-profit organization HALO on September 27th. More information about the auction can be found at haloworldwide.org. HALO Portland was born in 2009 with a goal to raise the annual funds for the Bukesa Children’s Home in Kampala, Uganda. The home provides a healthy environment for children who were previously living on the streets. This entry was posted in Acting, All, Directing, Models and tagged actors, all, art, directors, giving, models, Oregon. Bookmark the permalink.